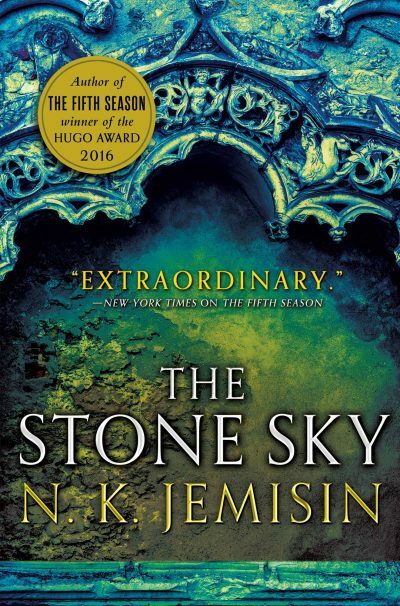 2017’s The Stone Sky is the third and final volume in N. K. Jemisin’s The Broken Earth trilogy. The Moon, long ago torn from its orbit around the Earth, is returning. Two women, Essun and her daughter Nassun, have the power to determine its course: a) past the Earth and back into interplanetary space, b) back into orbit around the Earth, or c) directly into the planet itself. Nassun, having had a good look at the evil humans do, is firmly convinced the third option is the correct one. Essun might be able to change Nassun’s mind if she could just talk to her daughter. Unfortunately for the thin film of life on the surface of the planet, mother has not seen daughter since Essun’s late husband discovered his children were orogenes (people with the ability to command geological processes), went berserk, murdered one child, and kidnapped Nassun. All of which happened at the beginning of the trilogy. Essun’s orogene powers do let her know where Nassun is: on the far side of the planet. The long walk ahead of Essun would be bad enough in regular times. This is not a regular time. It is a Fifth Season, a time when a vast geological calamity has humanity teetering yet again on the edge of extinction. The sensible thing to do would be to find some huddling place to wait the apocalypse out. That is, it would be if Nassun weren’t preparing a final apocalypse that will be much, much worse. And if the Earth itself were not reaching out to exterminate the species who stole the Moon from it. I’m still on the fence about whether this book is fantasy or science fiction, not that it matters. The way it approaches orogene abilities is essentially reductionist and very SFnal. The abilities can be modelled and technologically exploited, just like steam or atomic power or weird quantum woo. On the other hand, the word “magic” shows up occasionally. Perhaps I should embrace the idea of overlapping sets. The narrative makes it clear that the scientists and technologists of this world pride themselves on their enlightened objectivity (while being as blind to their prejudices and personal self-interest as any soon-to-be-unemployed Google engineer). As the reader discovers, the root cause of the grand crisis facing this world was the determination of a great civilization to treat an oppressed minority as resource rather than citizens, and in so doing, ensure a prosperous economy. And to convince themselves that in so doing they were being eminently moral, ethical, spiritual, yadda yadda. There was nothing of which they had to be ashamed. Nothing. On a personal level, Essun’s errand to Nassun makes sense: Essun wants her daughter Nassun to live. For that to be possible, the final apocalypse must be deferred. But if one looks at this from a larger perspective, one wonders if negotiation, forgiveness, and coexistence are really possible. Non-orogene humans have been abusing the orogenes for forty thousand years, across vast cycles of civilization. It’s the one constant in history. Can this be forgiven and forgotten? More importantly, should it? Not to mention anyone in particular but … there are authors, successful authors with their own HBO shows, who could take lessons from Jemisin; how to finish an epic series on time, how to keep a complex plot under control, and how to critique abuse instead of revelling in it. Just sayin’. The Stone Sky is available here (Amazon) and here (Chapters-Indigo).